Chisato Minamimura collected the stories of those few remaining deaf hibakusha earlier in Japan and the stories of those now departed. Their poignant memories, alongside footage from the time are relayed through film, animation, sound and sign language, using state of the art Holo-guaze © projection technology, Woojer © vibration straps for audiences to wear supplied through VibraFusionLab and a specialized vibrotactile wearable for Minamimura created through VibraFusionLab by Jim Ruxton. This new artwork is one of a kind, strikingly original, providing new ways for all to experience and understand and learn lessons from the nuclear A-Bomb onslaught in 1945 and why it mustn’t be allowed to happen again. Scored in Silence builds on Chisato’s digital enquiry in particular to Chisato’s work in immersive kinaesthetic environments that blend movement, sound, vibration and sign language – the hallmark of Chisato’s artistic career to date with Chisato, drawing on the success of Chisato’s performance in Passages of Time (2016) at the helm of her own digital artwork. Holding Patterns, an exhibition curated and presented by Art Spin will transform the Planet Storage facility at 1655 Dupont St. from October 11th – 21st. The exhibition, presented in partnership with TAS will animate a series of storage lockers with commissioned and site-specific art projects. Recognizing the shifts and upheavals often associated with storage lockers, Holding Patterns explores movement, space, belonging, material culture, and transition. The exhibition investigates consumerism and the glorification of materialism, and touches on forms of marginalization in reference to issues of site-lessness, connoted by storage facilities. Storage lockers often house a unique range of objects from the precious to the useless, their contents acting as a metaphor for memory and forgetting, or the conscious and unconscious. Drawing together these varied realities of space, storage, excess, and access, Holding Patterns examines not only the personal stories, but the histories of urban development and community migration that accompany them. In 2010 Art Spin presented their first-ever group exhibition in the same industrial building where Holding Patterns will be presented, animating a 10,000 sq ft. space. This time they are opting for a smaller footprint through a series of 5×5 to 10×20 units, and are excited to revisit this building in their tenth year of programming. Mustering the verve and warmth of an East Coast kitchen party, The Association of Artist-Run Centres from the Atlantic hosted the biennial gathering of artist-run centres from across Canada in Charlottetown, in September 2017. The event brought together artists, administrators, thinkers, curators and the public to consider the flexible, responsive and provisional forms of organization that are increasingly necessary for the sustained evolution of contemporary artist-run culture. Innovative platforms for artistic collaboration were a key focus. The event will explored and shared ideas around the theme Flotilla, a nautical metaphor that identifies a loose structure—boats and ships of varying dimensions banding together in open water—with a particular resonance in a maritime region characterized by nomadism, temporary location, isolation, and the presence of the sea as a shifting ground and a vehicle for exchange. “More than 20 artist-run centres and collectives installed projects in vacant storefronts, on the open water and in home spaces, inviting visitors to test-drive their newest programming. Funded by the Canada Council for the Arts. 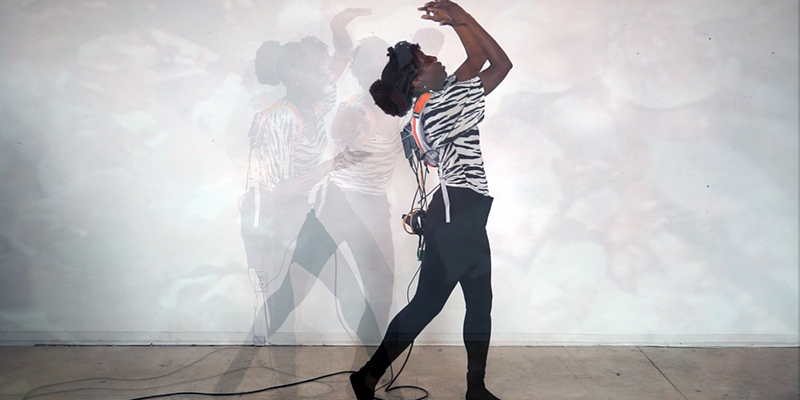 VibraFusionLab (VFL) began in 2014 in London, Ontario, growing out of an artist residency and collaboration between media artist, David Bobier and the Inclusive Media and Design Centre at Ryerson University. The vision, to provide access to emerging inclusive or adaptive technology and design, to artists of all disciplines and abilities, will be illustrated in the upcoming retrospective: VibraFusionLab: Bridging Practices in Accessibility, Art and Communication. The Thames Art Gallery is proud to host this immersive exhibition, which will feature educational ephemera on the mezzanine level, and works by seven artists involved in the residency program: Marla Hlady, Gordon Monahan, Lindsay Fisher, Alison O’Daniel, Ellen Moffat, Lynx Sainte-Marie, and David Bobier. The works specialize in the exploration of “vibrotactility” in technology, investigating it as a creative medium, with a capacity to combine visual, audio and tactile elements into a highly emotional and sensorial art practice. Viewers can expect wearable devices, and new approaches to art making that champion the senses beyond vision and hearing, to build new methods of communication and language. Tours for the hearing impaired and/or visually impaired are scheduled periodically throughout the exhibition; please visit our website to find out dates. The exhibition will run from Friday, May 5, to Sunday, July 2, 2017. An opening reception and website launch will take place Friday, May 19 at 7pm, audio and visual interpreters will be present. All are welcome to attend the free and all-inclusive reception. VibraFusionLab and The Thames Art Gallery would like to thank the Ontario Arts Council and the Canada Council for the Arts for their generous support. The Thames Art Gallery is located at 75 William Street North, Chatham, and is open 7 days a week, from 1-5pm. Contact Emily Cadotte, Assistant Curator at emilyc@chatham-kent.ca or 519.360.1998 or visit our website http://www.chatham-kent.ca/ThamesArtGallery for more. Image credit: Marla Hlady, Soundball (Dancehauling), 2013, sound (in collaboration with Eric Chenaux), 2 custom guitar amps, 2 custom soundball stands and 2 soundballs (stainless steel rice ball, microprocessor, sound board, accelerometer, LEDs and cable), software design by Wild Rhombus Software. Image courtesy of the artist. by Deirdre Logue in collaboration with VibraFusionLab. April 7 – June 30, 2017Co-presented with Images Festival, Gallery 44, and A Space Gallery, Tangled will host an exhibit of new work by Deirdre Logue in collaboration with VibraFusionLab. Logue pulls in close, withdraws, and attempts to go into the fabric of everyday spaces and objects. Private tests become public in these performative self-portraits, which push beyond the limitations of the screen. Logue’s personal experiments explore repetition of movement, sound and tension in ways that allow us to think about the multifaceted complexities of our own bodies. Logue’s collaboration with VibraFusionLab’s David Bobier invites multi-sensorial exchanges between the audience and the work. Vibrational haptics set the backdrop to a polyphonic soundscape integrating tactile audio and video extensions to engender disability art aesthetics. The audience and artist’s interactions in this work are distinguishing features of Deaf and disability art, exploring the space concerning our embodied experiences and the world. Jesse spent 5 memorable days at VibraFusionLab in April, 2016. Here is a short video of Jesse by Pam Haasen of London Fuse. Whoever said nothing cool happens in London? Percussionist Jesse Stewart locates to London with his pal and virtual modular synthesizer “Reactable” for a week residence at Vibrafusion Lab. Jesse Stewart is a percussionist whose playing has been described as “like four drummers playing different styles but simultaneously”, “exceptional”, “phenomenal” [Cadence Magazine], and other such small potatoes as “one of the finest young drummers and percussionists on the scene today” [Frank Robolino]. He has performed with artists of notable calibre such as Jandek, Joe McPhee, William Parker and Roswell Rudd. He was awarded a Juno in 2012 for “Instrumental Album of the year”. Stewart’s style of percussion–and most tangibly drumming–is a blend of control and loose, jangly improvisation. His use of the drum kit as more than a 4-on-the-floor time-keeper is remarkably engaging to witness. The meld of jazzy twitches and taiko-style booming war drums has the kind of influence on time that a really good kiss does. You get lost, you stop thinking about your daily woes, and you live presently for the time being. is an electronic musical instrument with a tabletop Tangible User Interfaceand backlit display facing up. The user places tangible objects on the surface of the table which creates a virtual modular synthesizer, creating music or sound effects. Thank goddess for David Bobier at the Vibrafusion Lab for inviting Jesse to bring his travelling instruments to London, Ontario for a week in residence at 355 Clarence Street from April 12th – 15th. Jesse will also be performing live at VFL on Friday night alongside Transmorphous Ensemble and Timothy Glasgow and as a special treat for Londoners, he will be playing a short set on Thursday April 14th as part of Cailen Dye’s Open Mic for Original Performance (also at Vibrafusion Lab). Moe Clark: multidisciplinary Métis artist, looping pedal mistress, spoken word poet, educator, artistic producer, public speaker, activist…… was our featured resident artist for November 2015. Moe came with one request – to explore water as the element of the research. The results were mesmerizing!!! VibraFusionLab is hosting 2 of Tangled London events and we are hyped!!! Tangled London 2016 is presented by “Tangled On Tour”: an annual series of disability arts events in cities across Ontario. In 2014 Peggy Baker devised Flux, in which a simple set of guidelines followed by dancers, non-dancers, and wheelchair users instantly creates a spontaneous, ever-evolving, and gloriously eventful group choreography.